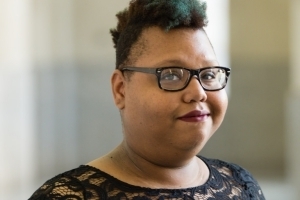 Brittany "Bri" Williams (SOC/ MA’17) is a game designer for the Wilson Center’s Serious Games Initiative, which was founded to use games to engage the broader public in policy discourse. Williams was passionate about games even when she headed to New York to get her BA in Film Production from St. John's University, however, it wasn’t until she made an hour long ugly-cry rant to her mother after watching the 2013 trailer for Kingdom Hearts III that she decided to look at game design as a profession. She earned her Master’s in Game Design from American University (AU) in 2017 and her career in game design is off to a strong start. SOC writer Savitree Jeamkijrung talked to Williams about her experience at the Wilson Center, and in AU’s MA Game Design program. SJ: What made you interested in game design and why? BW: For me, video games were an escape. Instead of watching or reading someone else’s story, I could make the story my own, and that was amazing to me. So, when I realized I could give people that same feeling it just clicked that game design is what I wanted to do. SJ: You currently work for Wilson Center’s Serious Game Initiative. What is most interesting about working there? BW: I think the coolest part of working at the Wilson Center is how supportive people here are about games. If we ever need to do research about a topic an expert is basically an email away. SJ: What game(s) are you working on? BW: One of the games I am currently working on is about key moments in Woodrow Wilson’s history, so being able to talk to scholars who are passionate about the topic is always fun. Other than the Wilson history game, I am also developing games based on Women in STEM, cyber security, and I just finished a game to help NGOs in China use games in their advocacy. SJ: Where did your passion for games come from? What would be your dream game to create (or what would you want to achieve with a game)? BW: I grew up playing Mortal Kombat with my family and hanging out in arcades with friends since I was a kid, so games have always been a part of my life. I think it wasn’t until I started playing horror games that I got really obsessed with games and the potential they have. My long-term goal is to make a horror game with highly sophisticated artificial intelligence. Enemies in the game would be able to adapt to the user’s play styles and "hunt" them accordingly. SJ: Why do you believe games are important? BW: It is because I know the power that games have. It is formed communities with members around the world. It is allowed people to find their passions. It can help educate people with more hands-on experience. It can be used as a tool for therapy and physical training. Games are a medium with endless possibilities, one just needs to know how to harness them correctly. BW: I knew that when I was looking for a master’s, I wanted to stay closer to my hometown in Virginia. American was actually on my list of schools during my undergrad search, so when I found out that AU had a master’s in Game Design it kind of felt like destiny. BW: The obvious one is the fact that I know how to code. I came into the school with only a basic knowledge of Java, and now I know C# and C++. I think the biggest lesson I learned was that community and teamwork are so important to make games. There were many times when things felt daunting and I wanted to give up, but thanks to my amazing peers and professors, I was able to push forward and make some really cool things. SJ: Do you have any advice to give to someone thinking about a career in games who is reading this? BW: Play games, watch games, make games. These may seem really obvious, but they’re some of the pillars of a good game designer. Playing games outside of your comfort zone will let you see how varied and interesting games can be. Watching playing and streaming of games lets you know how other players interact with games and allows you to see the triumphs and pitfalls of a game’s design. And finally, there are a number of ways you can make your own games. Unity and Unreal are free for anyone to use. Construct 2 and Twine are good entry level engines to dip your toes in. Do mods for games, make paper prototypes, make your own Dungeons & Dragons campaign, make board games. While a class or degree can help you get more technical details, there is no reason for you not to start making games now. If you have an idea go for it!